Two centuries ago — on February 7, 1812 — Charles John Huffam Dickens entered the earthly stage. Born into an impoverished family, his father having served a term in debtor’s prison, Charles worked as a child slave in a London blacking factory. The rags-to-riches life of Charles Dickens’s was more remarkable than any of his stories. From such unpromising origins, he arose to become the best-selling writer of his time and one of the most enduring and quotable writers of all time. 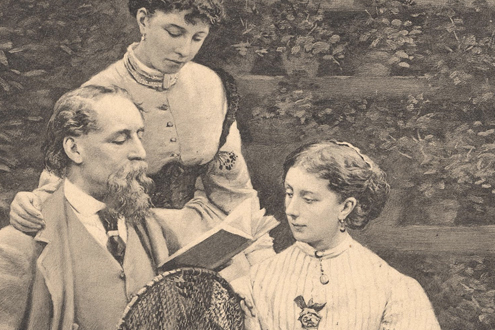 What has been described as the most successful writing career in history was launched when Dickens was 24. On March 31, 1836, he published the first installment of a comic novel about a bunch of bumbling gentlemen who knock about England getting into various scrapes. At the center of the group was one of the greatest comedy teams in all literature — Samuel Pickwick, a fat retired businessman, and a jaunty young cockney by the name of Sam Weller. The novel emerged as The Posthumous Papers of the Pickwick Club, popularly known as The Pickwick Papers. How did Dickens do it? First and foremost, he possessed a preternatural feel and ear for the hum and buzz of human life. People and situations endlessly flared up in his imagination; he said he could literally hear what his characters said before he wrote the words down. A supporting cast of more than 300 fantastic bit players floats in and out of Pickwick; over his career, Dickens gave birth to thousands of characters. And let us not forget the incredible piston energy that drove the man. His contemporary, Leigh Hunt, said of Dickens: “What a face is his to meet in a drawing room! It has the life and soul in it of 50 human beings.” Dickens did indeed possess the capacity of multitudes for work and play. In addition to pouring forth his literary works, he was a journalist, writer of long and vivacious letters, indefatigable walker, amateur theater producer and actor, and vastly popular lecturer and reader. James Nathan Miller describes the results of Dickens’s literary empathy and brimming vitality: “Incredibly, Dickens’s career never had a pinnacle. It was all pinnacle. From the appearance of Sam Weller in 1836 to the day in 1870 when Dickens died while writing The Mystery of Edwin Droid, his career was like a Roman candle that went straight up and just hung there, shooting one brilliant shower after another.” We today are still being showered by those sparks, as witness the more than one hundred motion pictures made from Dickens’s works.